As a car owner, you depend on your vehicle. It transports you and your passengers to your desired destinations. Without a working auto, your journeys won’t be as easy or even affordable to make. Some folks believe that the cost of car maintenance is rising these days. But, it’s possible to keep those auto expenses down. You just need to know how to do it! This comprehensive guide will show you how to get auto repair estimates that won’t break the bank! You might not believe it, but there are times where an auto repair isn’t necessary! Let’s consider the following scenario. You’ve noticed that your stereo isn’t picking up radio station transmissions. In fact, all you hear is a lot of crackling through the speakers! What you may not realize is that the aerial mounted on your roof could have come loose. Tightening it up fixed the problem and saved you money on a diagnostic check by a repair shop. Of course, that’s just one of many scenarios where a quick and simple check could fix the problem for free. Before deciding that you need some auto repair services, make sure there’s a problem to fix. I suggest reading your owner’s manual before doing anything. By doing so, you may find the help you need to resolve any issues yourself. Let’s assume that you’ve read your owner’s manual and the problem is still there. 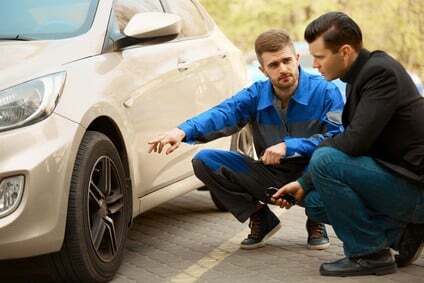 You’re no mechanic, and so you’d rather have a professional take care of it for you. The thing is; you aren’t too sure of the best way to resolve your problem. There’s a fact that many vehicle owners don’t know about. With some auto problems, there is more than one way to get them fixed! You might think that the only answer is to have your local auto repair shop handle things for you. But, did you know you could save time and money by choosing a better method? Let’s paint the picture of another scenario. It’s the middle of summer, and you turn your car’s air conditioning on. To your horror, you discover nothing but warm air coming out of your vents! By now, you might be thinking an expensive repair bill is heading your way. After all; condensers and compressors aren’t cheap! Or you could regas the system yourself at home using a DIY kit. Why have I listed the examples above? Well, when a vehicle’s A/C doesn’t work, it’s usually down to low refrigerant (gas) in the system. Automotive A/C systems don’t usually run out of gas because of a leak. It’s because they didn’t get topped up with gas at the last service. If you had a local auto repair shop fix the problem, they’d start by adding gas to the system first. In this case, you’d end up paying for a regas fee plus their hourly labor rate! The labor charged to remove the old parts and fit the new ones. You will also know that the prices charged for both elements of each estimate will vary. That’s because repair shops charge differing amounts for various reasons. For instance, your local franchised dealer will charge high labor and parts rates. But, they do so because they have higher overheads. Independent shops are cheaper because they can source parts from different vendors. Plus, their staff costs won’t be as high as they don’t also sell cars. Although there isn’t much you can do about labor charges, you can do something about the parts prices. You might not know it, but car manufacturers don’t make the parts they fit to cars. Instead, they outsource the manufacture of components to other companies. Another fact you may not know is that those firms sell those same parts under different brand names. Aside from the brand name, the only other difference is the price. The non-car manufacturer brand name will be cheaper to buy! It’s also important to know that other companies manufacture the same parts used on cars. That means you have a wealth of choice when it comes to the brand of parts you get fitted to your car. Once you know how much the parts are likely to cost, it’s time to get some repair estimates. First of all, you should start off with your local franchised dealer. It’s unlikely you will use them given their high cost. But, you will know what the maximum price will be that you need to pay. You can use the dealer’s repair price to compare against the estimates from auto repair shops. So, how should you do an accurate comparison? First of all, you should find out how long the repair is likely to take. Your local auto dealership can give you an approximate figure on your estimate. Next, look at the labor rates given by the other auto shops. Some may charge an extra hour in case of any problems. What happens if some charge more than an extra hour? You should probably avoid those shops as they are overcharging you. Should you supply the parts yourself? Usually, an honest auto repair shop will use vendors that offer the best parts prices. What happens if you can source the auto parts cheaper elsewhere? Many service centers will fit parts that you supply to them. But, the only thing they won’t do is guarantee the work. That’s because they won’t know the part you’ve got is the right one. Still, if you know you’ve got the right part, it’s a cost-effective way of saving money on your auto repairs. PreviousLooking For Discount Auto Parts Locations? Read This! NextCan I Trust Software to Correct My Punctuation? Looking For Discount Auto Parts Locations? Read This!